Everyone takes something different away from the music they hear. Sometimes an obscure lyric or chord or melody is seared into your head forever. Sometimes something everyone else digs barely registers with you. There you have the sum of my experience with Tom Petty. Roy Orbison — old Lefty Wilbury — was gone, so this incarnation of the Wilburys consisted of Spike, Muddy, Clayton and Boo Wilbury. You know, George Harrison, Tom Petty, Jeff Lynne and Bob Dylan. Still a good group. I’d listen to any group with Spike and Clayton, then and now. Muddy sang lead on two of the 10 cuts on the record. This one, with Clayton singing the bridge, has long been one of my favorites. “You Took My Breath Away,” the Traveling Wilburys, from “Traveling Wilburys, Vol. 3,” 1990. It’s still available. Still a good way to remember Tom Petty. As my dad and I sat down to lunch today, he handed over his grocery list and something else. It was a clipping from yesterday’s paper. The cover story on yesterday’s entertainment section in the paper was a guide to the year’s best music gifts. The mainbar was about the 10 best box sets. The sidebar was about the 10 best records that aren’t box sets. The clipping Dad handed me was from the mainbar. He’d written this note on the clipping: “Xmas for me REA.” His initials. “This is what I want for Christmas,” he said. After we got back to his place, and all his groceries were unloaded, I took that clipping and went directly to the record store. Dad just happens to live just a couple hundred yards from one of our indie record stores. Given that the Preservation Hall Jazz Band is a New Orleans institution, how about getting today’s song from another New Orleans institution? Enjoy this rollicking piano romp from another American treasure. 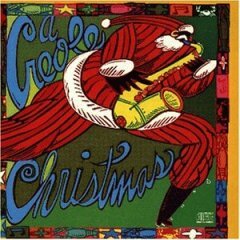 “White Christmas,” Allen Toussaint,” from “A Creole Christmas,” 1990. It’s out of print and not available digitally, but Amazon will rip you a copy. I once sent all the rips from this tremendous CD to a guy. He said he once had it on cassette, but that he’d played it so much that it had become “worn out and broken.” The guy said his wife would be so thrilled to have it that he was certain they’d be parents nine months hence. I never did hear how that turned out. Your Christmas music requests in the comments, please.